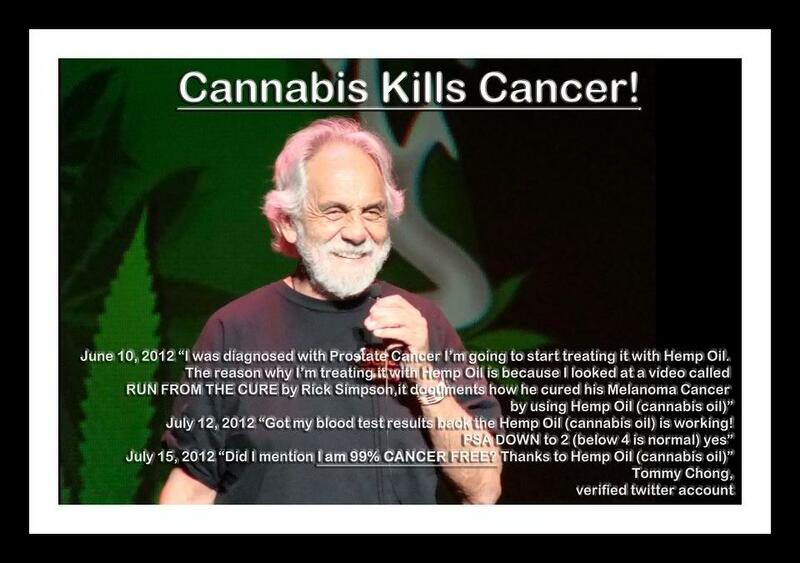 "Fighting fo the REAL Cure"
Tommy Chong is 99% CANCER FREE and soon he is going back on CNN to announce it to the world! The Media Blast Campaign is a targeted effort that we are working together with Phoenix Tears and hempoilhope.org to attract mainstream attention to the issue of cannabis extract medicine . It is only once this issue is examined with the scrutiny of the world watching that a world wide revolution will occur. To do this its going to take convincing the major news organizations like CNN, CBS, MSNBC, Fox News, and others Like Montel Williams or Jesse Ventura to investigate our cause further. The goal of this campaign is to persuade the news organizations to interview a patient or leader in this movement, like Shona Banda, Dennis Hill, Dr. Robert Melamede, or Rick Simpson (live or through video conferencing), and publicly analyze the myriad of science, testimonials, and research that clearly proves the truth. We would also like one of them to do a follow up interview with Tommy Chong. Doors of opportunity were recently opened by Tommy, when he made his announcement of treating his prostate cancer with cannabis oil on CNN (watch below). All major news organizations subsequently ran stories about that, thus making them more receptive to further information. We would like one of them to do a follow up interview with him to show proof of his progress. He is now 99% cancer free as he has stated on his verified twitter account. We have been told by sources close to Tommy that he will be going back on to CNN very soon to announce this to the world. The campaign works like this: A comprehensive summary document is sent to a news organization (you don’t need to worry about that, we've taken care of it). Below is a copy of what was sent to CNN. Your job is to support these efforts on your own, by contacting the news organizations through the mail and further requesting they investigate this issue and run stories on it. If you are a patient, please tell your healing experience. If you are a distributor, please talk about those you’ve helped. If you are a regular supporter, talk about why you are in this movement or even use a generic letter (provided below) that you can just fill in with your personal info and send in. Please keep all letters positive and focused on the healing power of cannabis oil. Do not talk about negatively-oriented topics like pharmaceutical conspiracies. As true as they may be, complaining about those problems to them does not further the core purpose of this mission. We must unite as a purely positive force to get media executives to take notice. 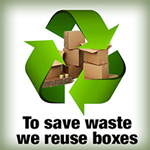 You can also call them at: 1-888-324-2773 or Post a Message on their Facebook page. MS-related material preferred. 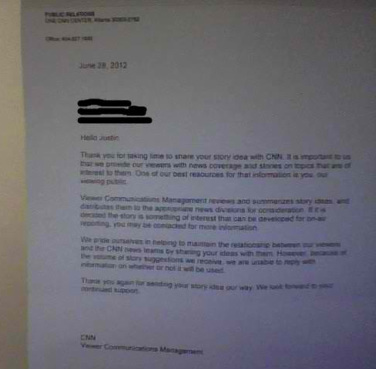 Below is the contact information for CNN, which has already responded to us see a picture of the letter below, and CBS. Further paper and electronic mail will entice them to give this even more attention. Or message them here: http://www.cnn.com/feedback/show/?s=storyidea. You can also email CBS at http://www.cbsnews.com/htdocs/feedback/fb_news_form.shtml?tag=ftr with the Category of “CBS Evening News” and the Type as “Request”. Stay tuned for more opportunities to support this campaign. Please do your best support this mission by sending in your mail/electronic messages to all four sources and sharing this page with EVERYONE. Let’s make this go viral and save the world once and for all! My name is (Your Name), and I am contacting you to express my support for investigating the cannabis extract medicine issue. You recently ran a story about Tommy Chong announcing he will cure his prostate cancer with cannabis oil. An abundance of scientific research and empirical evidence demonstrates that cannabis extracts can eliminate cancers in humans, as well as effectively treat other diseases much better than any mainstream pharmaceutical available. Please follow up on this issue by conducting your own research and interviewing a patient who has successfully treated themselves. You should also reach out to Dr. Robert Melamede, Dr. William Courtney or Rick Simpson for more information about the efficacy of cannabis extracts. I truly believe in the power of this medicine to change the world, and I know that if you follow this to the end, you will come to understand how revolutionary this is. I am contacting you because you recently ran a story about Tommy Chong’s self-treatment of cancer with cannabis oil. That course of treatment sounds absurd without background on the science, research, experiences, and movement behind cannabis extract medicine, and I’m here to give you a complete account of why Tommy is doing this and how deep this issue really goes. I am not special in any way and have no formal medical training. However, I have been in the cannabis extract medicine movement for over four years, and have come to know dozens of patients who have overcome horrendous diseases using cannabis extract oil oil, as well as doctors who are working with it. The majority of the people in this movement are regular people, usually around the age of 40 to 60, who simply followed instructions or devised new ways of extracting the oils from cannabis, and ingested them in the quantities necessary to have curative effects. Before dismissing these claims outright, I urge you to read through this packet. While you may not be entirely convinced that cannabis is the cure for most cancer, I guarantee you will agree completely that this issue deserves more attention immediately. If you have ever suffered from a disease or know someone who has, you owe it to yourself to look over this. The format of this packet will start off with the science of how cannabis works to combat a wide range of diseases. For every disease that people have alleviated with extract medicine, there is a peer-reviewed scientific study showing such a result would be physically possible. 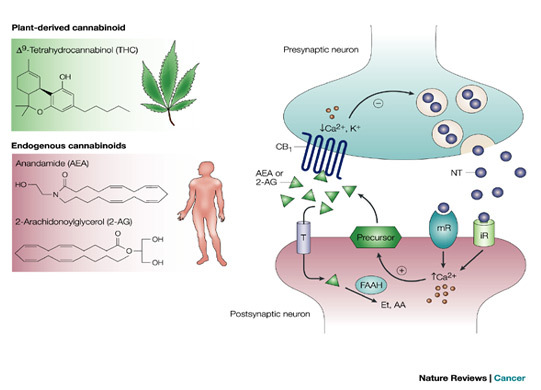 The endocannabinoid system, the fundamental system through which endo (internal, body-made cannabinoids, including anandamide) and phytocannabinoids (the external cannabinoids in cannabis) alike function, will be addressed, as understanding endocannabinoids is key to seeing how phytocannabinoids can heal such a wide range of conditions. Next, and the most important part, is the experiences of people with healing themselves. There are five documentaries about cannabis curing cancer, dozens of personal testimonials on YouTube, forums, blogs, and NBC/ABC/other local affiliates. This section will also describe the work of Cannabis Science, a publicly-traded company in Colorado that already has cured two people of skin cancer with oil. These cures are as solid as you can get; biopsy-confirmed cancer, topical cannabis oil as the only treatment, then biopsy-confirmed non-presence of any cancer. After discussing the science, testimonials and Cannabis Science work, I will give a brief history of how the cannabis extract movement started and who the major leaders are, then close with a conclusion. Before I begin, I will make perfectly clear what my goal with this endeavor is. The issue of cannabis extract medicine simply needs to go mainstream. People often ask, “If cannabis really cures cancer, why aren’t doctors using it or news agencies talking about it all the time?” The answer is the significant and numerous barriers to information being talked about on a national network. Even if someone low in the hierarchy approves of the story, it still needs to pass through multiple approval levels, and at some point an executive may decide that this sounds too crazy and could jeopardize the credibility of the news source. I believe the only main reason Tommy Chong was able to get his information mainstream was because he surprise announced his prostate cancer diagnosis and subsequent treatment with cannabis oil. Thankfully, local stations have had the courage to talk about other cases, but no truly mainstream station or paper has. As for doctors, there are many out there who support this, but far more are simply unaware of cannabis’ medical applications or have bought into government propaganda that it is a worthless medicine. But the best thing about this movement is the information just needs to get out there, and then the people will take care of it themselves. Anybody can make this medicine and treat themselves, and that’s why the movement has grown so much. It’s just too easy to make a small amount of oil, put it on a skin cancer, and watch the skin cancer go away. This has been achieved by many patients and confirmed scientifically by Cannabis Science. By having this information go mainstream, millions of people around the country could treat themselves, then come out in swarms showing how effective this is. Even more profound then skin cancer treatments would be to treat 100 terminal cancer patients with the full oil treatment, and watch how many get cured. More information about the endocannabinoid system has been elaborated upon by Dr. William Courtney, who has treated individuals with a unique, raw form of cannabis extract medicine with amazing success. Normally, chemical messages between cells are sent from the presynaptic cell to the postsynaptic cell. The endocannabinoid system is the only system that enables biochemical feedback from the postsynaptic cell to the presynaptic cell, essentially going upstream. For example, if a cell is firing too much, then the endocannabinoid system uses biochemical feedback to tell that cell to stop. Most importantly, there have been hundreds of studies documenting cannabis’ positive effect on nearly any disease you can think of. Virtually all of these studies have focused on one or two cannabinoids, THC or CBD, and have been done with tissue cultures or mice. Anybody with any experience in the scientific community knows that just because something works in a culture or mice, doesn’t necessarily mean it will work with humans. However, given that so much empirical evidence has demonstrated these studies do translate to human cases, they must be given more weight than usual. Below is a short list of studies and the relevant diseases. An extremely complete list has been compiled by an experienced, compassionate woman who goes by the name “Granny Storm Crow” online. This list can be viewed at the link below, right before the excerpts of studies, and as you can see, science shows that cannabinoids are effective for everything from amyotrophic lateral sclerosis to ulcerative colitis. This is by far the most important section of this packet. There have been thousands of people who have had direct healing experiences with extract medicine, although unfortunately only a small proportion of these people come out and talk about their experiences. This is because of the stigma associated with cannabis use, the fear of arrest, and because of sheer apathy once someone is cured. Most people assume that once someone is cured of cancer with this medicine, they will automatically start shouting it from the rooftops. But often, the drive to share this knowledge diminishes once the state of desperation has ended and because of the above reasons. Thankfully, there are still many, many cases of people sharing their stories, through videos, forums, blogs, social media, and news reports. Below are 28 videos hosted on YouTube that describe a variety of patient experiences, then 4 full-length documentaries, and below these lists I will delve into some of the most important cases. By watching each and every one, a true picture of this medicine’s effectiveness comes to light. Now, I will focus on some of the individual cases/videos. The first three documentaries, “Run From the Cure”, “Cured: A Cannabis Story” and “Vitamin Cannabis”. Run From the Cure is the documentary that started it all (and the one Tommy mentioned in his original CNN interview), and is about a man named Rick Simpson discovering that cannabis extracts could cure cancer, and his subsequent treatment of hundreds of individuals in his small Nova Scotia town. More about Rick Simpson will be explained later. The second is a simple story about a man named David Triplett who cured skin cancer with cannabis oil. Vitamin Cannabis is a saga about a man named Kyle Marsh who runs a small cannabis extract lab and has cured several cases of cancer. Vitamin Cannabis is remarkably detailed, and the first part of it shows extensively how dosages were administered and calculated. Other amazing results are witnessed besides cancer as well. Next is the Leaf documentary, which I feel represents a future beyond that of even oil. It was produced by a doctor, Dr. William Courtney, who treated people with juiced cannabis. The documentary tells the story of a lupus patient and a brain cancer patient who experienced remarkable recoveries by ingesting large quantities of juiced cannabis, as in one to two plants worth per day. The advantages of juicing include retaining the active enzymes of the cannabis plant and the strong turpene antioxidants, as well as completely unaltered cannabinoids. However, a benefit of oil is that the tetrahydrocannabinol and cannabidiol become decarboxylated, allowing them to theoretically work more effectively. Dr. William Courtney’s work shows that cannabis, processed into oil or not, can heal very effectively. Another benefit is that juiced cannabis is non-psychoactive, which is the only main problem with oil (although that can be used in a non-psychoactive manner if dosages are controlled and tolerance is slowly built). The last link that I wish to address directly, although I will point out a few other great ones as well, is Dennis Hill’s video. Dennis was my Aunt Reva’s meditation teacher, and back in March 2010 was diagnosed with a particularly aggressive form of aggressive prostate cancer. Having been in cancer research for 10 years and keenly aware of the risks and side effects of traditional therapies like chemotherapy, radiation, and surgery, Dennis sought out an alternative. He happened to be talking to my Aunt Reva about his predicament, and she recommended looking into cannabis extract medicine. She gave him my email address and we started talking. I showed him all the evidence at the time and connected him with someone who could supply oil, a great man named Christian Dior. Dennis ended up using a combination of cannabis extracts, first cannabutter and then Christian’s oil, and in six months was cured of his cancer. The ABCLocal article refers to the Cash Hyde story, in which a father helped cure his 2-year old son of brain tumors with cannabis oil, delivered through his feeding tube. Although the son also had radiation treatment, the treatment was only expected to stop the spread of tumors, and was also making Cash extremely sick. With the cannabis oil, Cash did not need any other complimentary drugs and had his tumors completely eliminated, defying doctor’s predictions. There are also several forums where people recount their experiences. An oil producer and myself have collaborated on HempOilHope.org, where you can read many completed experiences and experiences in process. GreenPassion.org is another amazing site for experiences, and several posts have been copied from GreenPassion onto HempOilHope (with permission and noted, of course). These are further sources for more experiences. Over the past year, many capable individuals have joined Cannabis Science because they believe in its mission. In February, Dr. Moe Afaneh joined as Chief Operating Officer, with experience as the youngest lead pharmacist in all of Florida and an extensively diverse educational background. Just recently in June, Dr. Roscoe M. Moore, Jr. a retired US Assistant Surgeon General, joined their Scientific Advisory Board. There is no doubt that in the next few months, Cannabis Science will continue to do great things. Despite the power of these materials, no amount of video watching or blog reading replaces talking to actual patients. Once you’ve talked to around a dozen, the reality of this fully sets in. I have talked with more patients than there are testimonials here, as there are so many people on forums and Facebook who tell their stories. Every time I see a testimonial, I message the person who wrote it for more details, and thus have gotten to know a lot of patients. Because of the amount and intensity of all these experiences over the last four years, I would bet my life and my family’s lives on this medicine. People have been using cannabis medicinally for thousands of years. In recent history, cannabis was one of the most widely used medicines, being sold in extract form in pharmacies all across the country. It was recommended for almost anything, and worked very well. Once cannabis was criminalized, against the will of the American Medical Association, the medicine disappeared. When cannabis use resurfaced strongly in the 1960s, medicinal extract use surely did as well, but no substantial knowledge is known about that point. The modern extract movement can be considered to have started in 2003, when Rick Simpson cured himself of skin cancer with the oil and began treating others for free. Below is a summary of Rick Simpson’s life and court trials. The details come from a combination of my interview with Rick Simpson in 2008, material from Run From the Cure, and news articles from Cumberland News Now. The material about the court trials is especially telling about Rick Simpson’s character and the risks he took to continue sharing this medicine. Rick Simpson was born in Springhill, Nova Scotia on November 30, 1949. He went to work at the age of 16, and began a career in power engineering at 18. Simpson continued with this line of work for the rest of his life, until in 1997 when he suffered a work related injury, and was diagnosed with post-concussion syndrome (Rick Simpson). Simpson was prescribed a number of drugs to alleviate his condition, although none of them worked at all; in fact, they worsened his condition considerably (Rick Simpson). In late 1998, Rick watched an episode of “The Nature of Things”, where he saw Dr. David Suzuki interviewing medical marijuana patients who had achieved astounding results. This prompted him to try medical marijuana for himself, and he found that smoking cannabis did more for his condition than any of the pills he was taking. Despite the effectiveness of his self-administered medication, no doctor would give Rick a legal prescription for cannabis. They said it was “bad for the lungs”, so Rick asked his family doctor if it would be better to extract the essential oils from cannabis, as that would be a way to bypass smoking. Despite Rick’s suggestion, the doctor still would not prescribe him cannabis. Until 2001, Rick continued taking prescription medicines until his doctor told him they did not have anything else to try on him, and there was nothing more they could do. It was then that Rick started using hemp oil as his only medication, and it improved his condition dramatically. In late 2002, Rick was diagnosed with skin cancer, which was present on three parts of his body; two patches on the face and one on the chest. In January 2003, Rick had one area of skin cancer removed surgically, and the other two parts were scheduled to be removed at a later date. Shortly after the surgery, Rick remembered a radio show he had heard in 1975 about how THC killed cancer cells, and since Rick’s oil was concentrated THC, he decided to try it on himself. He applied hemp oil to bandages and put them directly on to the skin cancers, and in four days, the cancers were gone. Excited, Rick went back to his doctor’s office to inform them that he had cured himself with hemp oil, but the reaction was alarm (Rick Simpson). The receptionist and doctor, David Forsthner, didn’t even want to hear more about a patient who had cured their own cancer. The negative reaction did not hinder Rick in his pursuit. He figured that if hemp oil worked topically, it might also work internally. Subsequently, he tested it on willing participants and saw that it cured internal cancers as well, and it was not necessary that hemp oil only be applied to the skin (Rick Simpson). Through further observation of hemp oil’s effects, Simpson has found that hemp oil eases pain better than morphine, lowers blood pressure and cholesterol, regulates weight, controls diabetes, heals burns and wounds quickly with no scar tissue, and is effective at treating a myriad of conditions related to defective cells (Run From the Cure). Rick Simpson’s activities have gotten attention from the media. In October 2006, Global National News aired a story about Rick’s activities. Two months later, another story aired on Global Maritimes Evening News (Run From the Cure). Rick also gained publicity from his brush with the law. On August 3, 2005 the RCMP raided Simpson’s home, arrested him, and took 1,190 cannabis plants (http://www.cumberlandnewsnow.com/Justice/2007-09-13/article-370849/Seized-marijuana-plants-had-value-up-to-830000-RCMP/1 - originally AmherstDaily.com). However, this number is false, and the number actually seized was 1,620 (Rick Simpson). “It may be better to lock me up right now. As soon as I get home I’m going to treat my patients. I’m going to grow that plant until the day I die, so I might as well be put in jail today. I can’t stop in the middle of [treatment]. 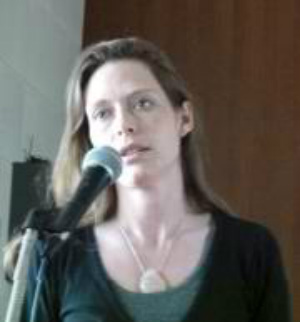 People’s lives are at stake here.” (http://www.cumberlandnewsnow.com/Justice/2007-09-19/article-381209/Simpson-guilty/1). Simpson was scheduled to return to court for sentencing on November 30, 2007. However, while awaiting sentencing, Simpson was arrested again for trafficking THC, and was remanded for four days until being released. When Simpson was sentenced for his first charges, he only received one day in custody, which was deemed served by his court appearance, and a two thousand dollar fine. Judge Cacchione explained his decision, saying, “Mr. Simpson has a sincere belief he has a cure with this oil and should be commended, but in reality, he broke the law.” The only reason he did not discharge Simpson was because he thought it would send the wrong message, in that if you do not like a law, you can freely break it without any penalty (http://www.cumberlandnewsnow.com/Justice/2008-02-11/article-382416/Simpson-considers-leaving-country/1). In early 2008, Rick went to court again for one count of trafficking THC, and was sentenced to eight days in custody by Judge Carole Beaton, which like in the first case, was deemed served by his remand time. Due to the fact there was no profit involved in Simpson’s activities, he had endured two separate drug charges and got off a free man on the same day of his sentencing (http://www.cumberlandnewsnow.com/Justice/2008-02-11/article-382416/Simpson-considers-leaving-country/1). It must be acknowledged that Simpson never sold any hemp oil; he provided it all at his expense, as further exemplified by his court trials (he would not have gotten off if he was selling the oil). He also refused to stop providing hemp oil to patients even after his first arrest. If Simpson’s results were not legitimate, why would he have spent so much money giving away hemp oil, and continued to do so even in the face of harsh penalties? That is a fairly complete history of Rick Simpson, absent the most recent details regarding his travels in Europe and South America. He is currently working on this issue remotely, by giving seminars and educating others. However, he no longer produces or distributes oil. Other leaders in the movement have already been discussed, including Dr. Robert Melamede and Shona Banda. There are also countless distributors who help people in their communities and lead on a local level. Over the past four years, I’ve seen so many wonderful people come into this movement, getting in because of their own healing experience or someone they love. It is a great tragedy that all of these people have had to live in fear for simply trying to save their own lives, but nonetheless, many have had the courage to share their stories and help move this cause forward. As you can see, this is an issue that needs attention. The science, experiences, and potential is all there, and change must come now. It is impossible to look at all this and believe that cannabis extract medicine does not have real potential. Is it just a coincidence that hundreds of scientific studies and multitudes of research show cannabis is effective against nearly any disease, and people are using concentrated cannabinoids in high quantities and having extremely effective results? The vast majority of patients are able to get off of all or nearly all pharmaceutical medications, including patients who have gotten off of hundreds of milligrams of oxycodone/hydrocodone using only oil. This works time after time, and to ignore that simply because it has been regular people achieving the success and not mainstream scientists is absolutely terrible. Imagine how frustrating it is to have success curing yourself of a disease, and then be told you’re stupid, it was spontaneous remission, this couldn’t work (which many doctors say upon hearing such news). It’s time to end the madness, and give this issue the rigorous examination it deserves. Of course, there have been several failures and incomplete treatments with this medicine, although there have been far more successes. There have been terminal patients who started the oil and recovered partially, but still died. There also seem to be some types of cancer that are particularly resistant to the medicine, such as breast cancer. It is not surprising there have been failures, considering all of this is done outside medical environments and by regular people treating themselves. What’s truly amazing is that the successes have outweighed the non-successes so heavily, given the state of how this works. Once this is legal, and research is done into better production techniques, better strains of cannabis, and better routes of administration, the successes will climb even higher. I must reiterate that all this movement wants is a thorough examination of our claims. While we all know this can cure cancer and other diseases, we don’t expect the world to believe that fully, but we DEMAND the full scrutiny of science immediately. That means a controlled administration of cannabinoids to terminally ill patients or testing it on skin cancers to prove once and for all this works. I don’t think that’s too much to ask. I hope you make the right choice and decide to share this. I can connect you to people who have been cured of diseases with this medicine, as well as executives of Cannabis Science if you are interested. Many of them are fully willing to be interviewed. There is one thing I want you to know before ending this. No great gains in life are made without sacrifice or challenge. To think that we will be given freedom and health with absolutely no risk or work is ridiculous. YOU need to have the courage to share this. Thank you for your time! I trust you will have the courage to do what is right, and perhaps play the final role in healing the world. But no matter what, I’m glad you have this knowledge now.